I bought two of the more interesting-looking hybrid smart watches to compare their functionality to each other, and to the Nokia Steel HR I already own. In the end, the Skagen Jorn Connected (Amazon) is a better watch and extension of my phone, but is not enough of a health or fitness tracker to replace the Nokia Steel HR; and the Misfit Phase (Amazon) has useful functionality but a poor design and feel. Neither offers the notification features I’d find most useful. Watch: tells time and date, wake-up alarm, stopwatch, timer. Activity Tracking: measures and records various types of activities and exercises. Biometrics: tracks vital statistics such as heart rate and sleep. Goals: motivates the user to achieve goals such as amount of activity and sleep. Phone Control: enables remote control over phone functions such as music playback. Phone Notifications: displays notifications from your smart phone. Music Player: stores and plays music. Fashion: communicates lifestyle choices and acts as a status symbol. The Skagen Jorn Connected and Misfit Phase hybrid smart watches function as watches and fashion pieces, with limited amounts of activity tracking, biometrics, goals, and phone control and notifications. Both lack any sophisticated displays, even a small and limited one like that of the Nokia Steel HR. Instead, they use the hands of the watch to signal, like a secret spy decoder ring. The prices are in the same approximate range. I bought both at discounts via special offers. (I did not get review copies, nor did I notify either company that I planned to review their watches). I paid $95 total for the Skagen including shipping; $89 total for the Misfit including tax. Fashion is in the eye of the beholder, but if you’re looking to avoid something that screams “I’m going to the gym after the office,” both watches are about as far from a thick black plastic wristband as you can get. Both are available in a variety of colors and band styles. 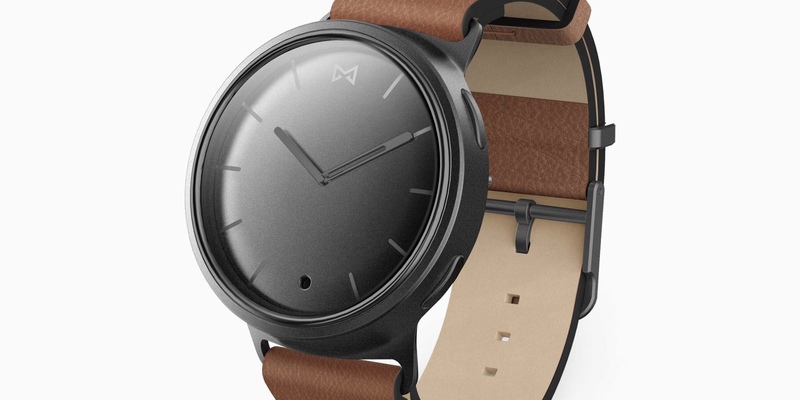 There are a few more varieties for the Misfit, but personally my taste favors the Skagen. The Skagen is objectively superior as a watch. Its hands are easy to see and the watch face is well-designed for telling time. I chose a poor color combination on the Misfit due to limited supply, but even the best combinations of face and hand coloring aren’t as good as the Skagen’s designs. Both watches lack a second hand, something I often wish I had during exercises at intervals such as EMOTM (every minute on the minute). The Misfit has a vibrating wake-up alarm, a feature I really appreciate; the Skagen lacks it. Neither watch has an illuminated display, a feature I am used to. I often look at the time on my Nokia Steel HR in low-light or dark conditions, and my Timex Weekender has an Indiglo backlight I use similarly. The Skagen has an exterior ring with a series of numbers used for functions such as displaying the date. These are a bit smallish, but they work okay nonetheless. There are three physical buttons, which are all customizable to perform various functions. The MisFit has two buttons, one of which shows progress towards activity goals and the other is customizable. I’ll discuss these more later. Overall design isn’t simply a matter of taste. 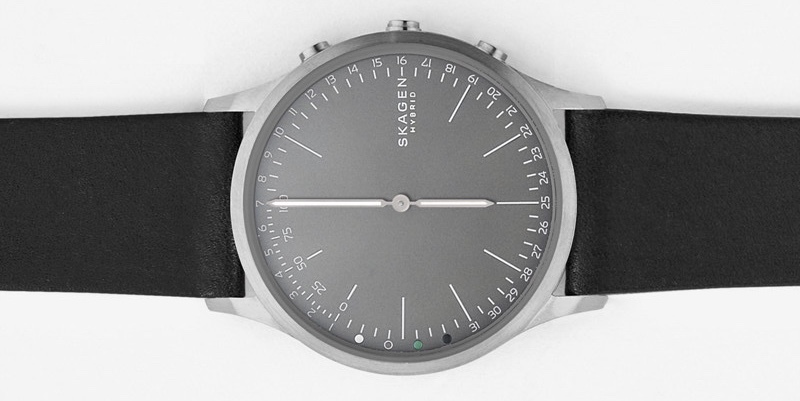 The Skagen is better designed, period. It sits flatter and closer to the wrist, has a thinner profile, and it’s lighter. The Misfit Phase is heavy and thick, jutting farther out from the wrist and interfering more with clothing. I wore both watches at the same time, one on each wrist, trading them back and forth at times so I could feel each of them on both my dominant and non-dominant hands. The difference was stark. At times, the Misfit felt like I was wearing a kettlebell as a bracelet. It was most noticeable when doing things like shaking water off after washing my hands. The Skagen blended in and became nearly impossible to notice, even at times like that; the Misfit never stopped being noticeable. The Skagen sat naturally on the outside of my wrist, ready to glance at; the Misfit wanted to rotate around and get on the wrong side of my wrist, even when I wore the band quite tightly. The Misfit’s band left ugly impressions on my skin, possibly because I was trying to wear it tightly enough to keep it in place. The watches’ quality felt different, too. I paid $20 extra for the leather band for the Misfit, but I’m not sure the band is real leather. It certainly doesn’t feel like it; it feels stiff and crackly, like a coated paper product instead of leather. It’s not very flexible and is difficult to buckle, tuck into the keeper loops, and unbuckle. It makes me worry that if I got it at all wet, it would swell and come apart. The Skagen’s band is standard and interchangeable, unlike the Misfit’s bespoke design, and feels like it’s much better quality. Likewise, the Skagen’s buttons feel like they’re precision-made, without any side-to-side wiggle, but the Misfit’s buttons felt loose. Both watches use standard watch batteries and have months of battery life. The real battery life will vary with usage. If there are a lot of vibrating notifications, I assume they will run down sooner. But not needing to take the watch off and charge it frequently is a big attraction for me. The Misfit claims up to 6 months of battery, while the Skagen is less specific at claims of 4-6 months, but I don’t see why it shouldn’t be about the same. The Skagen arrived with 99% charge remaining, whereas the Misfit was only about 60% battery charge. I didn’t notice any battery drain during my testing period (a few days). Both watches can receive notifications from smartphones via Bluetooth and the corresponding app from the watch company. I have an iPhone, and I can’t comment on how these watches will work with Android, but they lack a display. Thus, they are limited to vibrating and indicating what type of notification is arriving, and, to a limited degree, from whom. Both of them move the watch hands to various positions, which are user-customizable, to convey this detail. It’s a bit like the old-fashioned semaphore signals I learned in Boy Scouts. The Skagen Jorn supports a combination of people from your contact list, and apps from a predetermined list of supported apps. It indicates which app or person is sending you a notification by moving both the hour and minute hand to that position on the watch’s face, for a total of 12 (up to 6 apps and 6 contacts). I tested this by adding my wife as position 1. When she texted me, the watch vibrated and moved the hands to 1:00 briefly. The Skagen iPhone app supports a variety of app notifications, including those I use most frequently: Google Inbox, HipChat, all calls, all text messages. I keep most of my notifications disabled, so this is nearly everything that can possibly notify me. (I don’t want Inbox notifications on my wrist anyway.) The exceptions to Skagen’s notification support are infrequent, but fairly important: Google Calendar, VictorOps, Tweetbot. The Skagen app doesn’t support those. The Skagen watch also has some small color-coded dots near 9:00, but these seem to be obsolete or merely decorative. The Misfit uses a combination of a small color-coded dot in a tiny window near 6:00, and hand positioning. You can choose the color and, depending on the type of notification, customize the hand positioning to show who sent the notification. I think this theoretically allows more specific notifications, but in reality I don’t think I will remember very many combinations of hand positions and colors. The Misfit doesn’t support very many apps, and none of the ones it supports are ones I use: Line, WeChat, Facebook Messenger, WhatsApp, Skype, Viber, Gmail. Misfit’s system of color-coding the dot isn’t very good. The dot isn’t light-emitting, so it’s very hard to see; if the ambient light is low it’s impossible. The color is simply a small physical wheel behind an aperture, and when a notification comes in, if you’re watching the aperture, you’ll see the colors cycle through, making it unclear what color actually belongs to the notification. In my tests, when my wife sent me a text, I couldn’t tell that it was a text message; there were too many colors flashing briefly. Nice idea, but it doesn’t work. Neither watch keeps the “semaphore” active very long, so if you don’t look at your watch immediately when it vibrates, you’ll miss the hand positioning. The Skagen lets you customize the watch buttons to recall the last notification, which is a nice compensation. The Nokia Steel HR also supports calendar notifications, a feature I use heavily via Google Calendar. Neither the Skagen nor the Misfit supports these, which is a major gap for me. It’s one of the things that lets me keep my phone silenced, out of sight, and out of reach. Both watches track steps, calories, distance, and sleep as well as activities. Both have apps that display these stats over time and try to motivate you to achieve your goals, though the Misfit is a little more goal-oriented than the Skagen, which lets you set goals but doesn’t make it prominent, seemingly content to be more watch-oriented and less gamified. (Misfit sent me push notifications congratulating me for meaningless things like achieving a personal best.) Both watches integrate with Apple Health, but the Misfit has a few more features: it integrates with more services in a variety of ways. Neither watch tracks heart rate like the Nokia Steel HR or most dedicated fitness trackers, nor do they have GPS or more advanced features offered in products from Garmin and other leading manufacturers. Both watches’ iPhone apps center around activity and sleep tracking. The Misfit has a two-tabbed home interface that shows “points” of activity (I’m unclear what these are; it seems artificial and I’m not that interested), distance/calories/steps, and amount of sleep. The Skagen shows the same data, without the vanity “points” metric. Activity tracking, goal-setting, and motivation are pretty unimportant to me. I care about tracking things like sleep and steps, but I don’t want an app setting a goal for me; I just want to measure how my biometrics change over time. I don’t want my watch or an app to track my workouts, either. My workouts don’t lend to standardized recording or tracking. The duration and intensity matter the most; the Nokia Steel HR tracks those, but I’ve found that I don’t care either for those stats or for the goal dial. That said, I don’t think I’m the best judge of goal-setting features, but I’d be surprised if they are more than a curiosity in the Skagen or Misfit watches and apps. If you want great activity and workout tracking, and goal-setting, I think you should buy a Garmin or FitBit. Sleep tracking seemed to work reasonably well: both watches counted about the same amount of sleep and about the same amount of light and deep (restful) sleep, albeit in very different patterns. And the Misfit seemed to think I went back to sleep, when I was really meditating after having been awake for a while. The light/deep sleep tracking seems dubious to me, but I’m not sure I can say whether it’s accurate or not. The Nokia Steel HR tracks essentially the same types of data, and it has always struck me as inaccurate too. Step, distance, and calorie tracking varied a bit between the two watches, but seemed reasonable. On the same day, the Misfit registered 1.8 miles, 2444 calories, and 4152 steps. The Skagen counted 1.8 miles, 172 calories, and 4276 steps. The steps and distance sound about right to me, but I have no idea why the calories are so different. Misfit can prompt the wearer to move after a period of inactivity, a feature I’ve never used. Skagen doesn’t support that. Misfit also, puzzlingly, seems to support recording heart rate and weight measurements via the smartphone app. When I tapped on these features, it asked me to permit the app to access the camera, which confused me. How would the camera be able to record a heart rate measurement? I canceled and didn’t bother finding out. My impression of the smartphone app’s features led me to believe I wouldn’t find the data really useful anyway. Both watches’ smartphone apps seem good quality and reasonably well done, although both are a bit of an adventure to navigate at times. 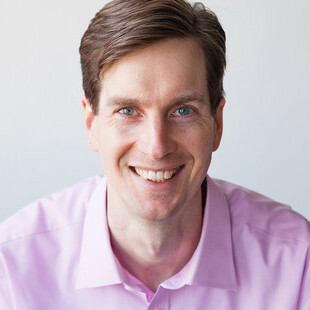 The watches’ designs themselves influence the app designs, so the apps can’t be expected to be simpler than the watches’ cryptic, spy-ring-decoder user experience. Both watches let you program the buttons to do extra things, via the smartphone apps. There’s quite a bit of overlap between them: the Misfit lets you control the phone’s media playback (start/stop/next/previous/volume-up), take a photo, control presentations (back/forward/blank), tag an activity or mark awake/sleep, and activate customized features through integrations with other services. The Skagen lets you tag an activity, look at the last incoming notification, view the date, see progress towards your goals, view a second time zone, ring the phone’s ringer, take a photo, and control the phone’s media volume and music playback (start/stop/next/previous). The Skagen has three customizable buttons and Misfit has only one. It lets you do more things without reprogramming the buttons, whereas the Misfit can do only one thing at a time. The Skagen’s music control is better. You can raise and lower volume as well as controlling playback, whereas the Misfit only lets you control playback and raise volume; and the playback control uses all of the combinations of button presses, which isn’t as intuitive. Misfit’s presentation clicker is a neat feature. To use it, you pair the watch via Bluetooth, which requires disconnecting from the smartphone. This is easy to do; I simply turned off Bluetooth on my phone and then my iPad found the watch and paired with it quickly. You can also pair with a laptop. I tested the clicker at distances up to 20 or so feet and it worked fine. With this feature, the Misfit can replace a dedicated Bluetooth clicker such as the Logitech Spotlight Advanced Presentation Remote, which costs more than I paid for the watch. The Misfit integrates with services through IFTTT, allowing you to extend your watch’s functionality pretty significantly. I don’t know how valuable this is. I am not sure I want a button press on my watch to do something like that. I think I’d like to keep that type of thing restricted behind at least my phone’s unlock code. I’ve found a few watches that are pretty similar to the Skagen Jorn Connected. I’m researching some of them to see what they’re like. As I do so, I’ll add them here. 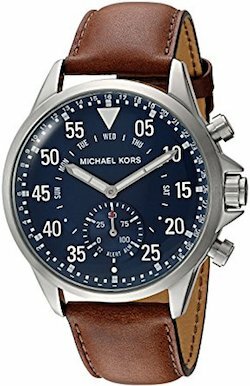 This is a nice-looking watch that seems to have similar functionality to those I reviewed in this blog post. From my research, I’d put it neck-and-neck with the Skagen in every score. 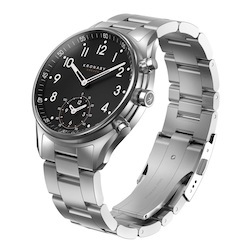 Kronaby specializes in hybrid smart watches. The models I examined seemed to be at the top of the class. They’re also a bit more expensive. 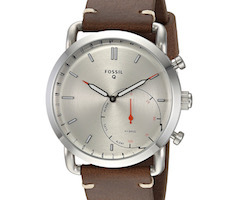 Another upscale watch with very similar functionality to those I tested from Skagen and Misfit. Both of these watches are attractive and fairly creative ways to use a traditional watch’s aesthetic to extend a smartphone’s functionality and provide some health and fitness capabilities. Both offer pretty similar features, including some I like a lot, such as long battery life. In comparison with my Nokia Steel HR, neither offers calendar notifications, which is a deal-killer for me: to keep my phone on silenced mode and tucked away in my backpack, I need phone, text, and calendar notifications on my wrist. And neither measures heart rate, a feature I have found extremely useful in the Nokia Steel HR, even though it isn’t perfect quality. In the end, I like the Skagen much more, and I want to keep it: its design and functionality are superior with limited exceptions, and its fit, quality, and feel are vastly superior. I can see myself using the Skagen in limited circumstances where I want to make more of a fashion statement than the Nokia Steel HR will, but that’d be an edge case. I don’t expect that I’d tolerate the Misfit Phase’s wrist feel for any length of time, nor do I find it visually appealing enough to want to wear it for the looks. Although I’m sure both will have plenty of fans, neither the Skagen Jorn Connected nor the Misfit Phase is enough watch to outdo a Timex, nor smart enough to replace the Nokia Steel HR.